I have been making my way up and down Kloof Street as there are so many lovely little restaurants as you head up towards the mountain from the city centre. Shelley’s Gourmet Cafe also seems to have been around for quite a while .. so along with two girlfriends, I popped in for a bite to eat. It has a lovely front outside stoep area, set back far enough from the road so as not to be disturbed by the traffic and passers-by. Inside are separate rooms (obviously once a residential property), which helps to break the hustle and bustle of the cafe. The decor keeps your eye wandering and gazing at the different techniques and textures used. 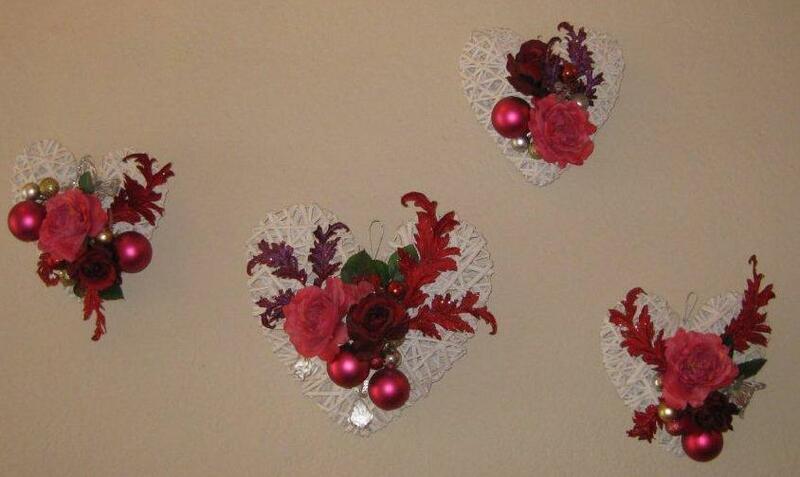 I think they have recently updated the decor to a more Christmassy theme … but definitely not over the top! Be sure to ask for specials of the day as we missed out on ordering the traditional breakfast which also looked really good. I tucked into the french toast which was a lovely portion of delicious sweet indulgence. One friend ordered the buttermilk pancakes which were also delightful. I couldn’t understand why a salad was served with the croissant with scrambled eggs. Cappuccinos were served a little bit hot for my liking and they unfortunately don’t offer soya or non-dairy options at this stage. In fact, the owner looked quite taken aback when I asked about a non-dairy option. The food was good, but for breakfast, the menu is a bit small. They have lovely cakes on offer and the lunch and dinner options look delicious (they are licensed) and I think I will try Shelley’s Gourmet Cafe again, but for a meal later in the day. 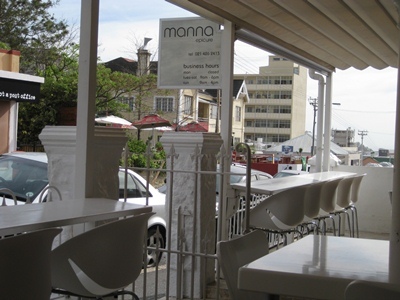 I have often driven passed Manna on a weekend morning and marveled at how packed the restaurant was. From the outside world, even with the buzz of people, Manna Epicure has a wonderful light, calming, sophisticated air to it and I aspired to one day going there. I finally decided on a quiet Sunday morning (when everyone else was watching the rugby) to indulge in their delights while accompanied by my Kindle. I walked up Kloof Street and sat at one of the long benches facing the street, taking in the glorious end of winter blue skies. Ordered my cappuccino and a grabbed a glass of water from one of the jugs available (either orange or strawberry fresh fruit infused) and took in the menu. A wonderfully generous fine bone china cup arrived housing a gorgeous creamy, frothy cappuccino. This made for such a nice change from the usual heavy, thick rimmed cups normally served. It was a tough decision on the menu, and I finally opted for a wonderful dish of poached eggs (perfectly done), smoked salmon (and what a generous portion! ), avocado and toasted coconut bread @ R85. The coconut bread was described to me as similar to banana bread – and it was, but it had this fabulous freshness of coconut permeating it. The bread is available to take home at R10 per slice or R150 per loaf. Extras are available should one wish to spice up a breakfast plate further. The food was fabulous, the staff were very friendly and I am certainly going to be back to try some of their other dishes. 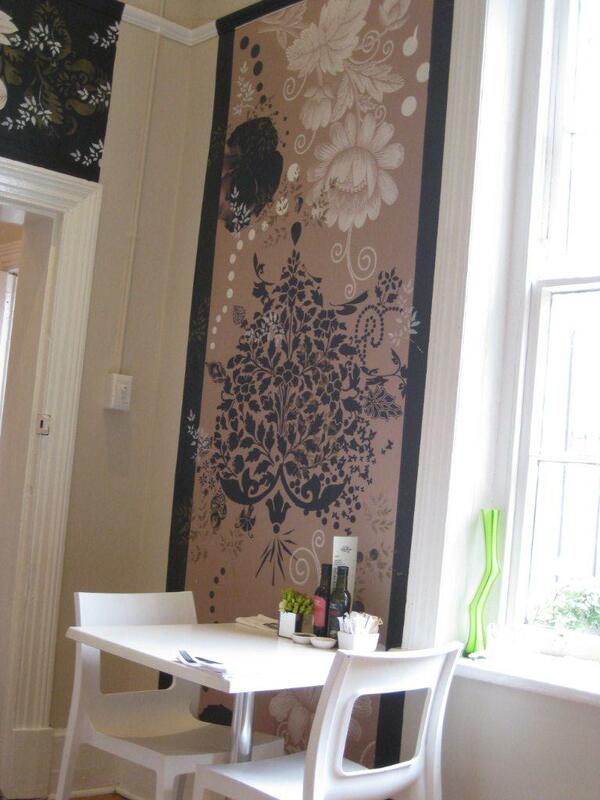 I might not benefit from another calm, city cafe vibe at Manna again, but I am sure even a busy restaurant will make for another wonderful experience. What a gorgeous Cape Town day it was. Sun shining, no wind! 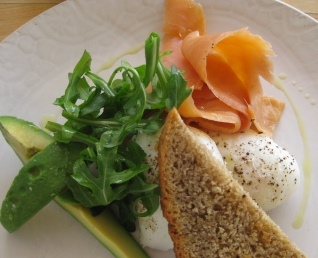 Perfect for breakfast and then a walk along the promenade in Sea Point. We sat outside and basked in the morning sun and admiring the view, while sipping on café latte in anticipation of a fab breakfast. Initially, there was some confusion as to who ‘owned’ our table, but once our orders were in, we were secure in the knowledge that our hunger would be abated. 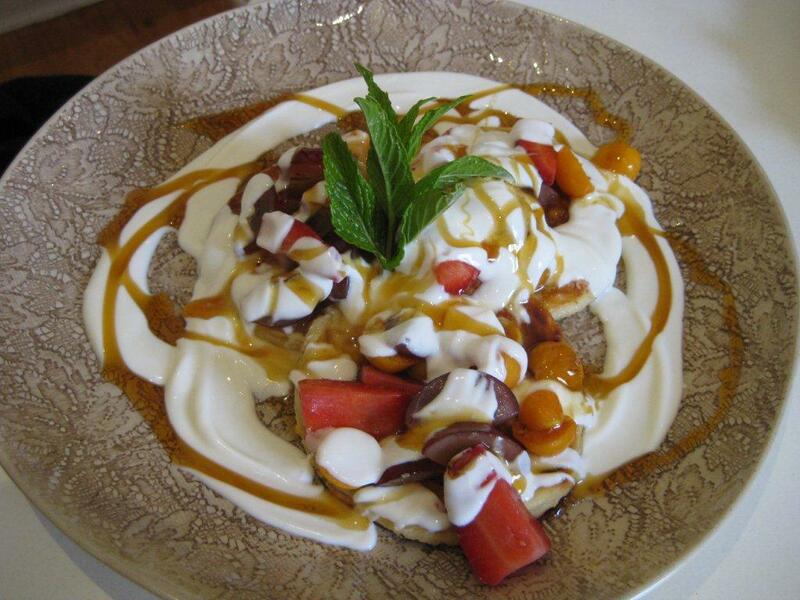 Standard health breakfast is up for grabs at R36 (muesli, yoghurt, fruit) as well as a Traditional Fry Up at R47. Add refried beans to your traditional fry up and you have the Mexican Breakfast @ R55. I was intrigued by the La Vie Breakfast of half a small ciabatta loaf layered with lettuce, bacon, 2 sunny side up eggs and all topped with a delicious onion and tomato mix @ R34. I was torn between that and the Mushroom Breakfast: a large brown mushroom topped with an egg, grilled tomato and caramalized onion and then sprinkled with parmesan @ R36 (add bacon or smoked salmon for an extra R10). But decided on the ciabatta and it was delicious! My friend took the eggs benedict @ R55 and they looked amazing! 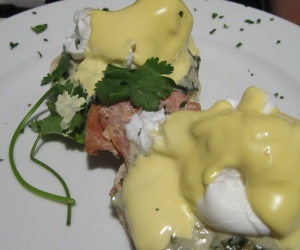 2 lovely fresh english muffins topped with a creamy spinach mixture, bacon (or salmon), soft-boiled egg, and covered in just the right amount of hollandaise sauce. Needless to say she gobbled it all up! It seemed a popular choice with all the other breakfast go-ers. Omelettes with various mixtures of fillings from R28 through to R45 as well as croissants / bagels also with a choice of inners from R21 to R52. 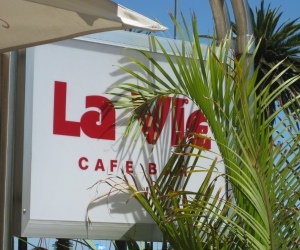 I really enjoyed the chilled vibe at La Vie, the coming and going of people and the great view out across the road, past the pavilion to the sea beyond. Inspired a 1 hour walk before heading off. Where to go for breakfast?